It is so much fun being able to interview successful people and share their stories with all of our listeners. Thank you Thrive Nation! Clay Clark’s podcasts are Phenomenal!!! 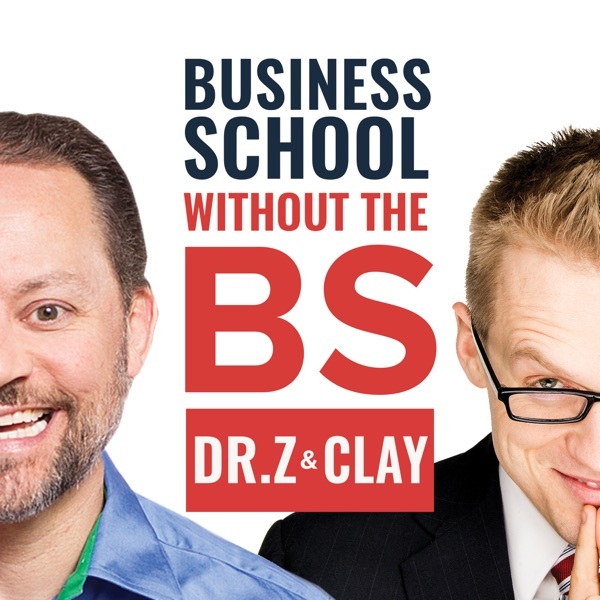 Clay Clark and his team do a great job of delivering insightful and practical business gems while also entertaining ... this is a tough combination to pull off yet they do it consistently and seemingly effortlessly. I started listening to Clay Clarke and his podcasts about one month ago. I can not get enough. I rarely play music in my truck now when driving and find myself wanting to drive further or clean my house so I can listen to all of the knowledge that is shared for free. As a business owner, it is critical to make as few of mistakes as possible. Clay and his guests are helping me avoid the land mines that kill Entreprenuership. His podcast is a must. Always showing different way you can run and do business. Not all businesses are the same and they get it! The guests are great and very intelligent, but the hosts are so obnoxious that it’s hard to listen to anything but their guests. Clay bringing the BOOM!! Love the show and love being a client! This Podcast Will Change Your Life!!!! Every podcast will inspire you and challenge you to become a better leader, person, and individual. The guests wisdom on this show is priceless. Get ready to go to the next level in your career, be it business or whatever your profession may be! You’ll learn tools and gain insight that’ll cause you to grow and change for the better! It’s a great show! Extremely informative and entertaining, highly recommend to those entrepreneurial minded individuals. Listening to the Thrivetime show on my way to and from work has radically changed how I approach life and the pursuit of my goals. If you want constant inspiration, clear action items for improvement, and pure entertainment then this is the show for you! Boom. Amazing podcast!!! Very informative and with practical steps for immediate implementation. Thank you to Spencer at EIT for telling me about this podcast. I have not turned off since I downloaded it. I travel quite a bit and it is always on. I love the information that comes for the podcast and guest that come on to the show. Great work and keep it!! A must listen for all entrepreneurs and Business leaders anywhere! The most business insightful, profound and downright hilarious podcast in our day and age-I love those Knowledge Bombs! By far my most favorite podcast ever! Not just great business tips but awesome life lessons as well! This show will motivate you and make you laugh! Absolutely recommend! I have seen an immediate improvement in my life since I started listening to Thrive podcasts! It jumpstart my day and helps me have that can do attitude! The show has good content and great guests. They provide excellent information for the business owner and those who want to be business owners. Clay goes to great lengths to try and make the show entertaining. I am always on the look out for great podcast the deliver amazing practical content. This show provides funny and entertaining business advice that you can actually use. Its also nice to know they are local to my state. Great show, try it for yourself! Clay & Dr. Z have the best guests! They talk about relevant topics for business owners and aspiring entrepreneurs. I love learning from their vast business experience as well as from their guests. I learn something every time I listen and my horizons are broadened. I listen as much as possible! I had been listening to business podcasts and searching for one that I could truly learn from for several months prior to finding this podcast. I came across the Thrivetime Show about 8 months ago and it was exactly what I was searching for. Rather than just hearing stories from successful entrepreneurs and wasting valuable hours of listening, this podcast provides you with actionable information. I have learned about marketing, management, developing goals, and the art of diligence. This podcast has changed the way I run my business and I could not be happier to be a subscriber. Found them over the summer. This is the first podcast that I found that has given advice that has actually benefited my business. I love listening to this show! I can’t get enough! Their workshop is a must! Listen to one episode. Then another. Then another. I can’t stop. No matter how far I scroll there’s something that needs to be heard. I’m an avid podcast listener and over the past few months The Thrivetime Show has taken precedence over all my other ones. In fact, I haven’t had time to listen to the other ones because I’m always listening to this one. Very educational but equally, if not more, important is it is very entertaining. I love their style of humor and the subtle DJ skills mixing some frame shifts throughout. Can’t get enough! I have been listening to Thrivetime Show any time I am driving for going on a month now. In that time I’ve gained so many real world tips and amazing insights from extremely successful business owners and entrepreneurs. I highly recommend to all of my friends and acquaintances go are business owners or aspiring business owners! By far the most helpful and energetic business podcast out there. I would absolutely recommend it to any business owner who wants to grow their business. This podcast has been great for my business. I have used several ideas and strategies and played several episodes during team meetings! It inspired me to attend the workshop in Tulsa which I’m looking forward to! Simply the BEST Business podcast!!! - LISTEN & LEARN! Thank you Clay Clark, Dr.Z, Eric Chupp & the whole Thrivetime Show Family for what you teach. Many more blessings your way. This podcast, for lack of more words, is simply AMAZING, Inspiring and extremely VALUABLE for any business owner & Entrepreneur or anyone looking to start a business, such as myself. Anyone that listens will: -Learn something of value-such as the importance of having “F6 goals”, checklists, systems, processes, and knowing your #s. -Be inspired to do more, give more & be more. So many great stories are told of clients they help, have helped and so many “knowledge bombs” are dropped from Clay Clark from years of experience and books he’s read. -Laugh: healthy humor is part of just about every podcast which is just one of my favorite parts of listening. They know when to be funny & when to be serious. I was introduced to podcast by one of your interns/employee turned clients now running an awesome photography company in Chicago. I’m glad I asked questions about how they started, how they met company that made their website etc. This is one of the best podcasts a business owner can listen to. They provide amazing information in an entertaining way. Thank you! I feel like I’m sure the first prospector in California felt- elated. I was casually searching for ways to pipe in better music into my Medical Office when I stumbled upon these Podcasts. I randomly chose a podcast just to check it out. That was about 20 podcasts ago. I hate the overuse of superlatives but WOW, really excellent content! I feel invigorated. This stuff is “Business Gold” I simply can’t wait to mine more of it. Mailman finds his way out!!! My name is Logan Mayberry.. I was introduced to your podcast when I moved to Tulsa from Los Angeles.. Your podcast has helped me tremendously! Keeping me focused & determined on where I’m needing to keep my thoughts and mind at all times! You are the MAN!!! Cannot wait to visit the workshop December 7-8!!! Let’s rock it out!!! 1....2... 3..... BOOOOOOMMM!!! I was searching for a new small business podcast when I came across your show. I randomly selected an episode for my drive home and was immediately disappointed. If not for my insistence to give you a chance, I would have stopped around 2 minutes in. However, I did take away two positives from your show: 1. You guys can talk over your guests with your own garbage and sound bytes (that are frankly dated and terrible) and stretch an eight minute interview into a forty minute show. Good job. 2. I have a new business idea. I can edit every show of yours to remove all the fluff so that people that are interested in your guests, and not hearing you two act like clowns, can benefit. Sorry gents but this show is littered with the “BS” you claim to weed out. One of the most entertaining and practical podcasts out there! For awhile I was listening while I worked out but I found myself constantly pausing my workouts to re-listen to the content because it was so good! I’m not a business owner but lead a sales team for a small business and this podcasts has equipped me to grow in my leadership and help our business go further faster! Highly recommend! Shameless self promotion of a small town business in Oklahoma. If you have tons of time to waste hearing about mediocre topics recycled from others... this is perfect for you!! I like it overall. The only reason it’s 4/5 stars is because of his repeated horrendous attempt at a Boston accent in the most recent episode about the Patriots. I’m from the Boston area and it makes me vomit in my mouth whenever people fail at mimicking the accent. After listening to dozens of other great business podcasts, I discovered The Thrive Time Show and their unique podcast. It’s engaging from the beginning and keeps me coming back for more. I am thrilled that this local (Tulsa, OK) business is able to make connections with such amazing guests. Thank you for creating experiences where business leaders can continue their self-development. This podcast is awesome it gives a lot of knowledge and wisdom that we can use and they don’t only tell us but show us how to apply the things we need to be successful ! I rarely listen to radio of podcasts outside of the political world. Thad show/podcast had been the kick in hte pants that I needed to move my career in a new direction. I have come to understand more about who I am and what I need to do to suceed. It is a great reference. I love this podcast!! I do not have enough words to describe how helpful this podcast is. Helpful, practical tips on how to start, manage and grow a business. It’s almost like reading a book of endless knowledge. Love it and recommend it! I love this podcast! Entertaining, educational, and full of strategies on growing your business and being more successful! I learned more in one episode then doing hours of research. I love this podcast! Listen and you'll learn something vaulable on every episode. The ThriveTime Show has been life changing. I have been a proud employee of Elephant In The Room for the last two years. As a former foster kid, no one has taught me more about life in 22 years then Clay has in the last year. EITR has became my family and Clays words are my gospel. Not only is it the greatest advice but the show is entertaining and keeps you engaged. The ThriveTime show has made a huge impact in my life. It’s the only podcast that I listen to. I am learning and growing more and more everyday to one day grow a business. Statistically most foster kids will fail, I however will thrive. Haven't had a chance to look through all the titles, but many applicable topics so far that inspire and make drive-time zip by. It’s simple, direct, and life changing. There isn’t enough words to describe how great this podcast truly is. It’s perfect for men and women looking to obtain knowledge that no school will teach you. The interviews and the knowledge bombs that Clay delivers are life altering if applied correctly to your own life. The only thing missing is a second share button to spread the word faster about the information you can learn while listening to everyone that speaks on here! This podcast is awesome. They do such a great job keeping your attention while also packing it full of useful content. This is combined with a diverse group of guests so you get authentic content from a wide array of successful people, which keeps it very fresh! I love hearing these podcasts. I would love to group interview interview with these guys. I love real people. Listened to the six part series on Managing Employees. It started off okay but quickly turned into a ridiculous rant with discriminatory references and unnecessary testimonials from his employees designed to inflate his ego? Trash other business Podcasts in the Top 20. Sell how wonderful it is to work for Thrivetime (whatever the heck that is)? Included racist impersonations of Asians, depicted millennials as being gay. Classless, useless Podcast.